On 1 June 2018 the Transition Accord will take effect, working to make garment factories in Bangladesh safer. It will continue the work of its predecessor, which was established shortly after the deadly Rana Plaza collapse in 2013, to inspect factories and monitor renovations in a credible and transparent way. The new Accord has a range of new features, including the fact that it now welcomes producers of home textiles and fabric and knit accessories, next to garment factories. This means that more companies can join and more workers can be protected. However, IKEA, the largest home furnishing company in the world, has refused to bring the home textile factories it sources from in Bangladesh under the purview of the Accord. The Accord offers the only road towards safer factories in a country in which voluntary corporate social auditing systems has in the past failed to prevent the thousands of deaths of the Rana Plaza and Tazreen factory catastrophes. In response to that, the Accord is a collective scheme, that is a legally binding agreement between a great number of brands and trade unions and contains extensive enforcement mechanisms. IWAY is no different from previous voluntary corporate auditing schemes: it is IKEA’s code of conduct, which is accountable to only the company itself. It lacks the transparency that makes the Accord credible and accountable; while the Accord publishes inspection and progress reports as well as lists of factories that have been terminated from the programme, IKEA makes none of this information public. This makes it impossible for outsiders to check whether IWAY is actually making factories safer. 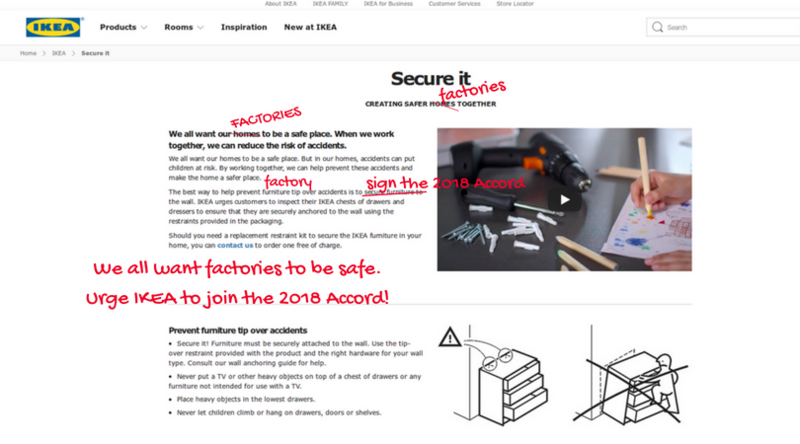 Moreover, while the Accord inspects all factories that signatory companies source from or sourced from in the recent past, IKEA only carries out audits in its main suppliers, expecting them to in turn check on their subcontractors. This suggests that IKEA wants to deflect responsibility from these suppliers and strongly decreases their possibility to oversee the process and be knowledgeable about working conditions in those factories. Get your friends and family involved with all of the above!